Bieber, Justin – Have you ever heard a Justin Bieber song that actually sounded good? (Hint: no.) Well, slow it down 800% and you get an ethereal, almost haunting piece of really interesting ambient electronica. Check out the link. Libertines, The – The Brit rock foursome are back onstage after a six-year split. With Amy Winehouse ex and noted hard-partier Doherty co-helming, it won’t be long before some of The Libertines fall back off the stage. 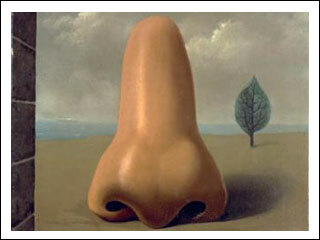 Heidi Montag shows her affinity for surrealist Russian literature in remaking her nose. Montag, Heidi –Half of Speidi explains that her nose bandage does not indicate more surgery; it is just a precaution to make sure the organ heals correctly. “I don’t want my face to fall off like Michael Jackson’s,” Heidi said. Montag’s nose, however, stated that it no longer wanted to be associated with the project but was bound to it. Newton, Wayne – Mr. Las Vegas finally shipped his private jet from Detroit, where it had idled for years due to expensive repairs, to Nevada, where it now rests in his back yard. Perhaps the rich aren’t that different from you and me: Wayne Newton has a non-working $2 million plane in his yard, and you have a 1972 Chevy Nova on your lawn that you were totally going to rebuild this summer but just didn’t have time. Seacrest, Ryan – American Idol’s host appears in this clip for 90210 as a…game show host. With the frosted tips and the suit, though, it looks more like Seacrest is channeling Corey Haim, and succeeds. Libertines return! This is awesome. the only downside – I loved getting two records (Babyshambles/Doherty and Dirty Pretty Things/Barat) instead of one.